If anyone hears about beef jerky, then the first question arises in the mind, is beef jerky healthy? There are so many rumours regarding beef jerky and most of them are baseless. We can answer the question in a single phrase – beef jerky is very much healthy. If you ask me why then this answer is also ready. Beef jerky contains a very little amount of fat, too few carbohydrates but rich in all sorts of proteins. The presence of such proteins helps the human system to be strong for any action. Beef jerky is made using spices and herbs that helps the immune system to become strong. 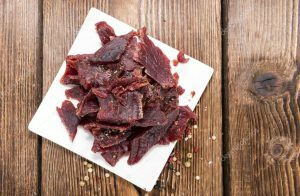 Overall, these aspects make beef jerky healthy food. If you talk about possibly diet or healthy diet, then you should eat snack items. Of course, snack item does not mean potato chips or chocolate packs. An ideal snack item helps to fill up your stomach when you have a good appetite. Fruits are also ideal for such scenarios, but when you are hungry then beef jerky gives you a stupendous pleasure. The meat is prepared after a lot of processes and it kept for several months without any freezer. That does not mean, beef jerky is having all good sides. It has a negative part, too. One has to be very careful about the intake of salt every day while eating. There are some people who eat salts too much and still they add salts while eating the beef jerky. Salt is already used as a preservative for future, so too much of salt might lead to a disrupted life. One should remember the issue. Hence, it is quite obvious that beef jerky is really a very healthy item.